Just when you thought the dust had blown over, a new generation of robot vacuum cleaners are starting to emerge from under sofas in South Korea. Samsung and LG are two of the world’s leading producers of robotic vacuums, and seem determine to persuade consumers to put their feet up, relax, and let the machines deal with the mess. The two brands boast some pretty exciting innovations in the world of cleaning up dirt off the floor, but which is really king of the carpets? Canstar Blue reviews robot vacuum cleaners from Samsung and LG, to determine which might be the best bet for your home. Samsung recently got everyone talking about robot vacuum cleaners again with the unveiling of its POWERbot VR7000 (pictured) – the latest addition to its family of high-end robotic vacuums. This new model is designed to offer unparalleled convenience, while addressing the short comings of robotic vacuums before it, namely clumsiness and inability to clean hard-to-reach places. The VR7000 has a pretty modest 20W suction, but compensates for this with Samsung’s new ‘Edge Clean Master’ and ‘Auto Shutter’ features which improve suction and enables the VR7000 to reach within 15mm of the wall. 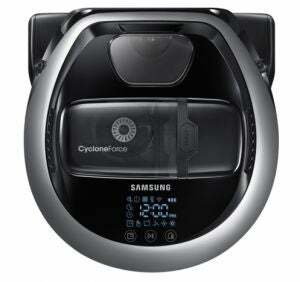 Its maximum run time on normal mode is 90 minutes, which is notably shorter than some other Samsung robotic vacuums. In standard Samsung appliances fashion, the POWERbot VR7000 comes loaded with intelligent features. It has visionary mapping and full-view sensors which allow it to map and navigate rooms and obstacle, as well as adjust its suction power to optimise cleaning for different types of floors. But that’s only the start. The POWERbot VR7000 can be controlled and monitored remotely by mobile app. You can even schedule cleaning times and check your cleaning history on the go. The VR7000 also comes with Amazon Echo, which lets users control their POWERbot through voice commands. 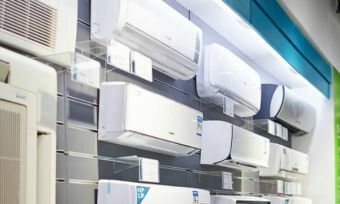 According Samsung head of product for home appliances, Mike Lilly, users can give each room a name and simply tell the POWERbot to go there and clean. The Samsung VR7000 doesn’t stack up to its predecessors in terms of specs, but it’s not really meant to. While Samsung robotic vacuum cleaners have always included intelligent features, the POWERbot VR7000 truly emphasises convenience while improving cleaning reachability. Samsung is not one to make cheap, low-quality appliances, and it’s no different when it comes to robotic vacuum cleaners. Even the least powerful POWERbot, the SR20H9050U, is comparable to leading products from other manufacturers, with 70 watts of suction power and a one-hour standard run time. For those willing to spend a little more, the POWERbot VR9200 is the most powerful robo vac in Australia, according to Samsung. The VR9300 also boasts a powerful engine, and has one of the longest run times you’ll find. All Samsung POWERbot vacuum cleaners include comprehensive room scanners for improved navigation, point and clean remote controls, and a host of different cleaning modes. The VR9200 can be monitored and controlled through a mobile app, while the VR9300 can be programmed to recognise and clean individual rooms upon command through a smartphone app. LG doesn’t claim that its robot vacuum cleaners have the best specs on the market, but that doesn’t mean these units are any less effective at cleaning. LG robot vacuum cleaners have a square design with long corner brushes to help it reach corners and edges. In addition, all LG robo vacs include a smart turbo mode that automatically increases suction upon detecting carpeted areas. The LG robotic vacs get smarter as they go up in price. With the Turbo models for example, users can set a ‘MySpace’ area. With the press of a button, the robovac will clean just the area you’ve identified. This is a great feature for households with rugs. 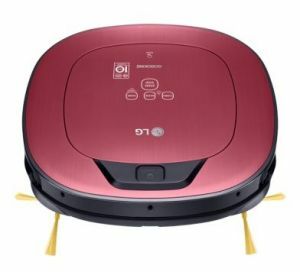 The top of the line LG robotic vacuum is currently the Roboking Turbo with Homeview. This lets users remotely operate the vacuum and see through its camera via a mobile app. It also serves as a security system, notifying you of any unexpected movement in the house while you’re gone. So which is better, LG or Samsung? LG and Samsung take different approaches to robot vacuum cleaners. On the one hand you have Samsung, which focuses on raw power and run time, while LG instead focuses on intelligent features and cleaning practicality. That said, both appliance companies offer some of the most effective robot vacuum cleaners in Australia, and both price toward the higher end of the market. Choosing LG or Samsung will largely come down to a matter of preference. Here’s a summary of the positives and negatives for you to consider. If you’re not entirely convinced by either of these brands, or they cost a little more than you’re willing to spend on a robot vacuum cleaner, you have plenty of other options. Keep in mind that while robotic vacuum cleaners are convenient, they’re not yet a suitable substitute to stick or canister vacuum cleaners. If you are in the market for a standard vacuum cleaner, then be sure to check Canstar Blue’s customer satisfaction ratings to see which brand Aussies prefer.